The fourth game in the Elder Scrolls series and the second, not having to mainline games relations. 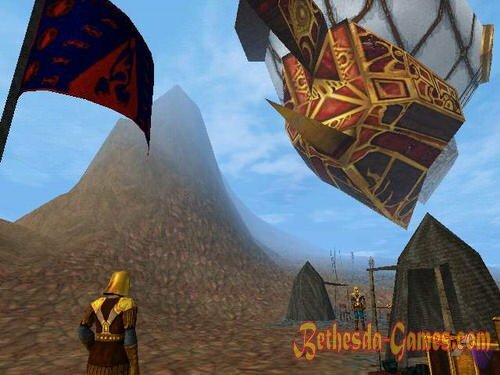 And if in '97 we saw Bethesda attempt to move toward action '(Battlespire), then a year later, our attention was presented a game in the genre of adventure. Everyone was waiting for a new full-fledged RPG, and got ... One of the best adventure, which had seen. Whatever may be said, analysts and marketers - the game failed. 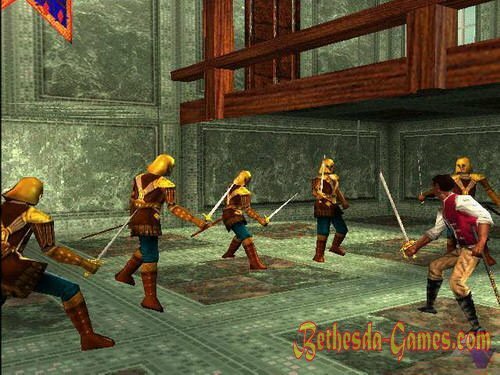 Anyone even slightly familiar with the series of games Elder Scrolls man waiting for a certain shock at the very beginning of the game - we will not allow to create a character. In our hands gets someone Cyrus - Redguard, a mercenary, a great fighter ... A native of Hammerfell, in his youth, he was forced to leave home because he had killed his sister's husband, the hero has vowed never to go back and start at the hard way mercenary shall comply with any work. Where others retreated in terror and refused the proposed tasks, it takes Cyrus - fear was unfamiliar to him. He is accompanied by faithful companions and friends, traveled to High Rock, Black Marsh, Morrowind, and where many more. Life was good enough Redguard mercenary, until there was a small but pivotal event in his life ... Letter. One of the three worthy causes that could give rise to a real adventure - in fact, the most powerful ones. Letter from Tobias, polunorda, an old friend and mentor, Cyrus in the past, informing Redguard about the disappearance of his sister, Isar. Throwing everything Cyrus goes on a journey to S'Tros M'Kai, an island in the Gulf of Illiak. This is the complication of the plot of the game ... And if you think that "only the island," You will not be enough - you are wrong. 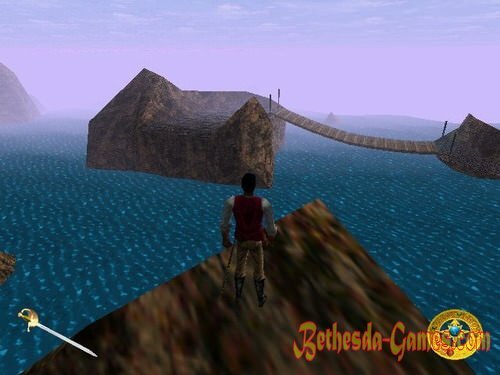 In the future you will not only study the island and raised it to the city, but also a journey through the cave goblins, visit Dwemer ruins, ancient observatory, escaped from prison and meeting with one of the most famous in Tamriel necromancers, a fight with a professional assassin and revolutionary activity. .. These are just general words that describe not all coming Cyrus adventure. But all of this ahead, but for now ... Enjoy the splash of foamy waves, the heating rays of the sunshine and the beauty surrounding you on all sides. 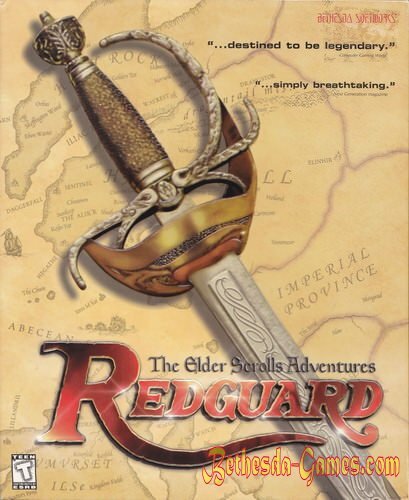 Redguard for its time really incredibly beautiful game. 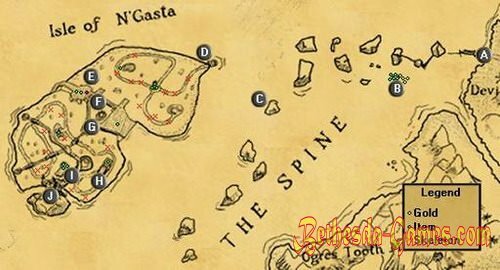 Whether it's a desert coast, jungle or mysterious castle necromancer - the performance of any location, any little thing, you met on your way to finding the sisters, deserves the highest praise. It makes no sense to talk about the technology - just take a look at the screenshots, and even better - download and run the game. Finally only add that the sound and dialogue (and there are quite a lot, as well as characters with which to converse) is not behind schedule, and the story - they are gorgeous, and this, in turn, allows more deeply into the world of Elder Scrolls for the first time to show us on this scale ... Dive into adventure, anyone, with few exceptions, do not leave indifferent.